It was here that Major Richard I. Bong was born, received his education, and grew to manhood. After attending Superior State College where he received his first pilot training, he joined the U.S. Army Air Corps on May 29, 1941. Assigned to the New Guinea combat theater of operations on September 5, 1942, he quickly proved his mastery in the air by shooting down two enemy aircraft in his first air battle. 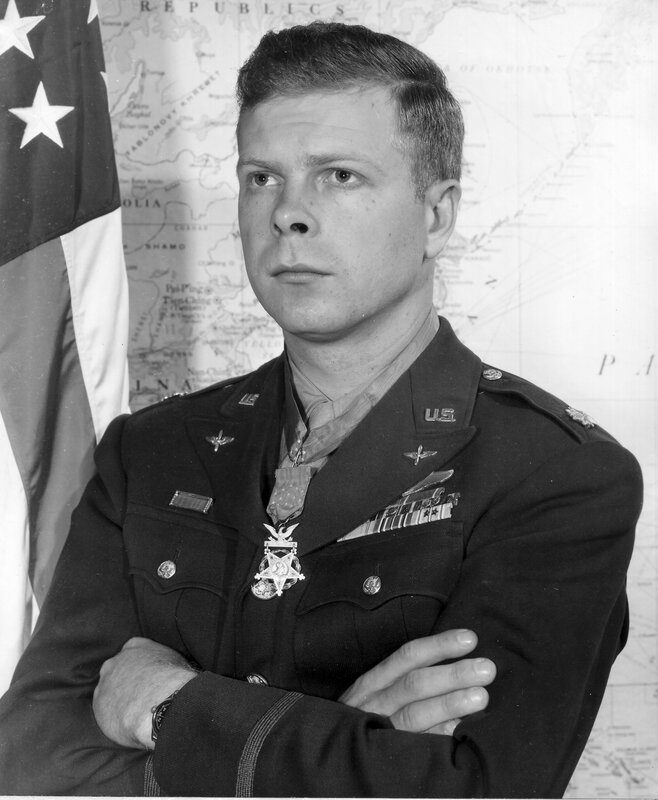 By destroying a total of forty enemy aircraft in air combat he became American's leading air ace of all time. Awarded the Congressional Medal of Honor by a grateful government and winner of many other military decorations, he lost his life testing a jet plane in August, 1945 and lies buried nearby. The marker is located at a highway pullout on westbound Main Street, between Village Road and County Highway D, at or near 9704 Main Street, Poplar, Wisconsin 54864. See also related markers, Major Richard Ira Bong and Major Richard Ira Bong Burial Site, at nearby locations in Poplar. The marker is located in Poplar, Wisconsin.